First of is Aggarwal whose group in 2001 building on asymmetric epoxidations and aziridations ( DOI) invented an complex indirect sulfonium ylide method (DOI). The main substrate is chalcone reacting with a chiral sulfonium ylide derived from a chiral sulfide and the carbene Rh=CHPh (generated in-situ from a tosyl hydrazone and rhodium(II) acetate). The 2001 report has gathered 114 citations to date but the cyclopropanation method described has not yet been field-tested. A direct chiral sulfonium ylide method is reported by Tang (Ye et al. 2002, 46 citations DOI). Next up is Gaunt et al. (the Stephen Ley laboratory) who in 2004 came with the idea to employ ammonium ylides as Michael donors with a cinchona alkaloid as chiral catalyst. (DOI). This reaction is organocatalytic. 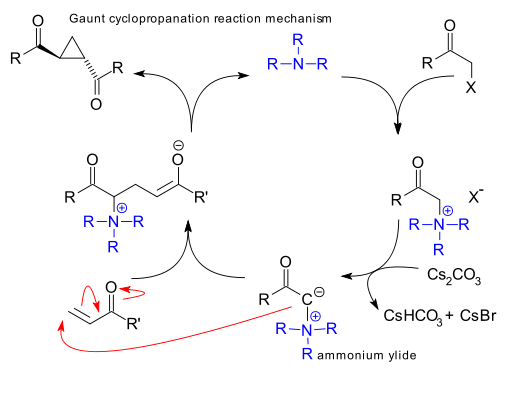 In the reaction mechanism the tertiary amine displaces a halide group in a haloketone and then a base (caesium carbonate) abstracts a proton to the ammonium ylide. The first report clocks around 50 citations to date but is applied only once in a total synthesis of eicosanoids(DOI) and not very successfully as enantioselectivity for the particular step is poor. A third method (Kunz/MacMillan, 2005) is a direct sulfonium ylide method DOI. An improved catalyst exists (DOI).